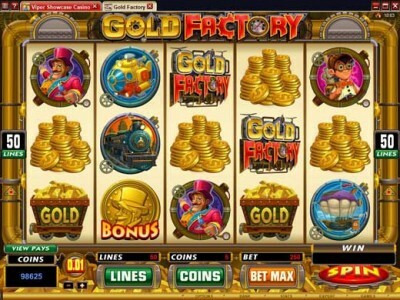 Gold Factory online pokie is one of the most loved and played of any game titles. In this game you take a trip by train, by hot air balloon, or by yellow submarine to the rewarding and magical Gold Factory. This online pokie features 5-reel 50-pay line where you will encounter gold bar symbols, gold coins, and gold medallions, as well as various other character animation including the factory Manager, the Factory Worker and the trolley cart. The Gold Factory Logo is the highest paying symbol and if you are lucky enough to hit 5 on an enabled payline your return is 7,500 times your original bet size. WOW! The Gold Factory Logo is also the wild symbol which substitutes for all others. Look out for the Gold Bonus Medallion which is a scatter symbol rewarding entry inside the Boiler Room Bonus. Once inside you can select 4 from 12 boilers which sparks free credits or up to 35 free spins with all payouts doubled. If you are lucky enough you can also move from the boiler room into the reactor bonus which grants even lager prizes. Gold Factor online pokies is one of the most popular colourful slot machines with amusing sound effects and stunning visuals. The fifty pay lines provide heaps of winning opportunities and the bonus game is really fun.